When the Futurists extolled the dynamism of the machine, machines had not yet become common in daily life. As the First World War ended, however, a new age of ubiquitous technology truly began. Man Ray trained as a draftsman specializing in engineering and machinery and was therefore ideally qualified to picture the appearance of this new subject in terms specific to itself; in terms, at least, of its popular appeal. For while Vorticists like Lawrence Atkinson had already coopted the techniques of mechanical drawing to give to abstract subjects a cool, machinelike look, Man Ray used techniques developed for advertising tecnhnological products to give to the invented machine we see here the glamour that attached to machines themselves. This drawing was prepared by stencils and templates, over which an airbrush was used. Then carefully ruled lines, meticulous lettering, and areas of painstakingly filled-in gouache complemented what, in effect, is a presentation drawing for a manufactured object - but one whose function is irrational and obscure. Whereas the dynamism of the machine is the pricipal subject of pre-First World War technologically obsessed modernism, the function and then the appearance of the machine become more important as artistic subjects from around the time of the war. This is partly to be attributed to the increasing familiarity of machines and to disenchantment with technological force produced by the war. While further from an actual machine than [Severini's Armored Train in Action (1915)], Man Ray's drawing looks more closely at the workings of machinery than that does; and it does so ironically. It also, however, makes the structure of the machine its own structure. Before this could happen there was required not merely a new attitude and knowledge of technology; also, a new perception of the function of subject matter in modern works of art. Once the subject and the object of modern art converged, as they did in collage - where representation of a still life was replaced, in effect, by making a still life - the work of art became an object more in the world than of it. A curious impasse was thus produced, for further to increase art's objecthood could only, it seemed, lead to works of art that were simultaneously subjects and objects - like "real" objects in the world. To follow this path would be to surrender most of the traditional reasons for making art at all. Hence Picasso's return to representation after the First World War. Marcel Duchamp, however, did carry the objecthood of modern art to its logical conclusion. His "readymades" are common manufactured objects, detached from their contexts, that function as art objects themselves, with subject and object as one. Manufactured objects were ideal for this purpose because they, like art objects, were artificially contrived. The machine, and things made by machines, thereby became paradigmatic of what art itself was in the world. 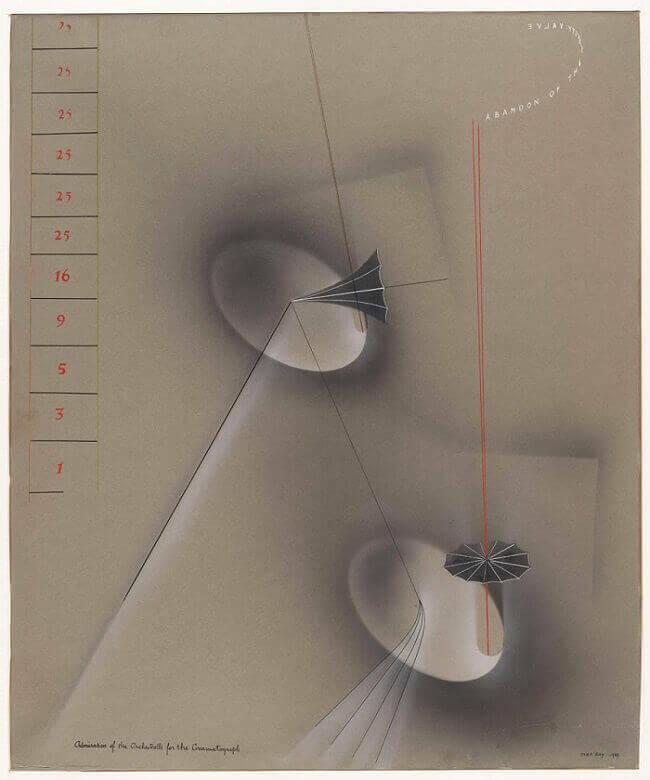 In Man Ray's drawing, not subject and object but subject and structure are one. This also derives from Duchamp: from the so-called Large Glass that followed his first readymades, from which Man Ray also takes his sexual interpretation of the machine. The female "Orchestrelle" leans over invitingly to the beaming Cinematograph. "Abandon of the Safety Valve" trails through the air like one of those advertising slogans still to be seen pulled by turning aircraft, but a novelty then. And in a strip up the side of the drawing, even, passion begins rising, then reaches climax and crosses the edge of the sheet.